What would it take to reach 1200 ppm CO₂e? The IPCC's AR4 contains a scenario of 1,200 ppm CO₂e getting reached with a corresponding temperature rise of between ~5°C and ~10°C above preindustrial. 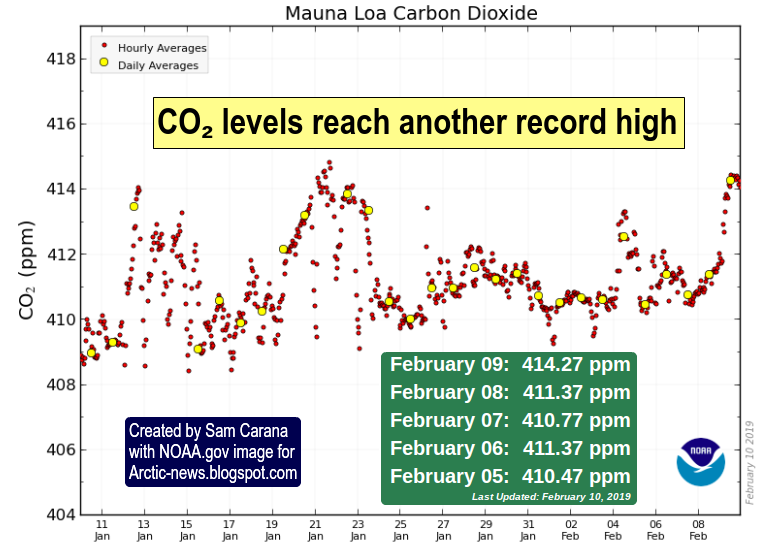 NOAA's figures for greenhouse gases add up to a current level of 500 ppm CO₂e. NOAA's figure for methane's GWP is too low, especially when considering a rise within a decade. When using this 500 ppm CO₂e, it would take 700 ppm to reach 1,200 ppm, and if 1 ppm equals 7.81 Gt of CO₂, then 700 ppm equals 5467 Gt of CO₂, which may seem a lot, but at a GWP for methane of 130 (10-year horizon) it could be reached instantly with a burst of methane of some 42 Gt, i.e. less than Natalia Shakhova's warning that 50 Gt of methane is ready for release at any time. 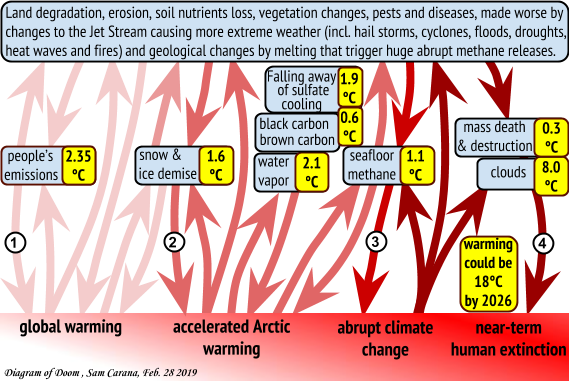 In above image, further warming elements are included, in addition to methane and CO₂ and it takes until the year 2026. As an earlier study points out, life on Earth will already have disappeared with a 5°C rise (see box on the right). It took a long time for life to evolve on Earth. At first, hardly any species could live on land, as there was no ozone layer to protect them from UV radiation. Also, there was no oxygen in the air to breathe. Life formed some 3 billion years ago and bacteria first developed the ability to decompose carbon dioxide (and produce oxygen) some 2.3 billion years ago. Then, worm-like creatures started to multiply strongly, using more and more oxygen and producing more and more carbon dioxide. Eventually, this resulted in a sharp fall in oxygen levels, leading to extinction of these species. This first mass extinction was followed by a spike in oxygen as both the species in the oceans and plants on land continued to produce oxygen, while these first animals went extinct. 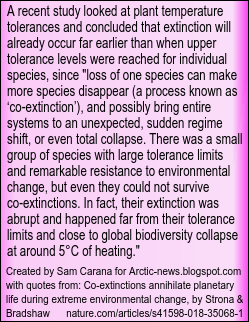 Temperature changes dominate in subsequent mass extinctions, and each time it took life a long time to recover. We've now entered the Sixth Mass Extinction, as oxygen levels are falling, oceans are acidifying and species are going extinct at accelerating rates. 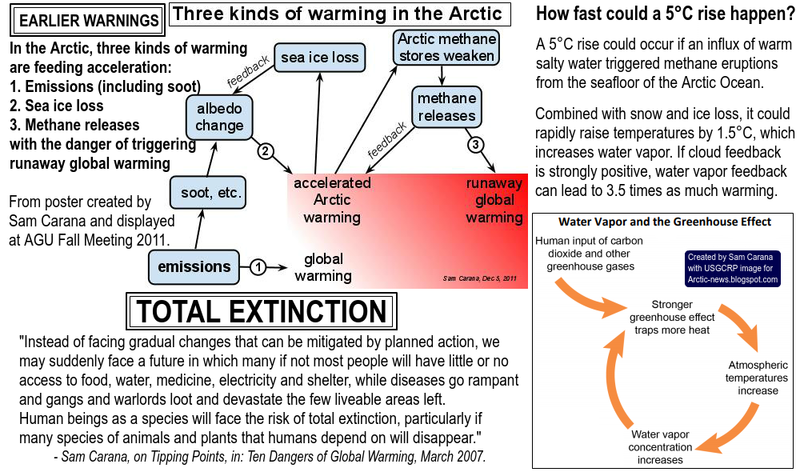 A 2013 study calculated that species are facing warming that occurs 10,000 x faster than their natural ability to adapt. 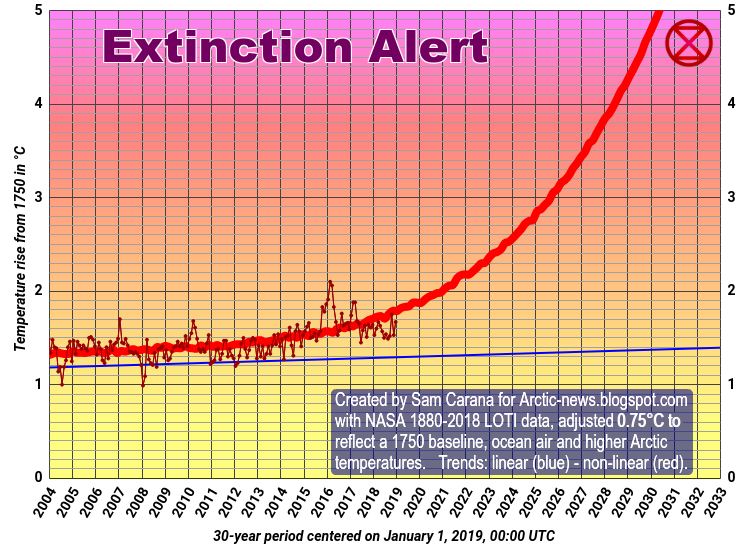 The speed at which temperatures and greenhouse gas levels are now jointly rising is so large and so unprecedented in Earth's history that many doubt that there will be any life left on Earth by 2026. Can humanity change its course? Given that humanity appears to be on a course to omnicidal destruction, what position can we best take in response? In the light of the dire situation, dramatic reduction in pollution is needed, as well as further action. Indeed, the Paris Agreement constitutes a global commitment to comprehensive and effective action. 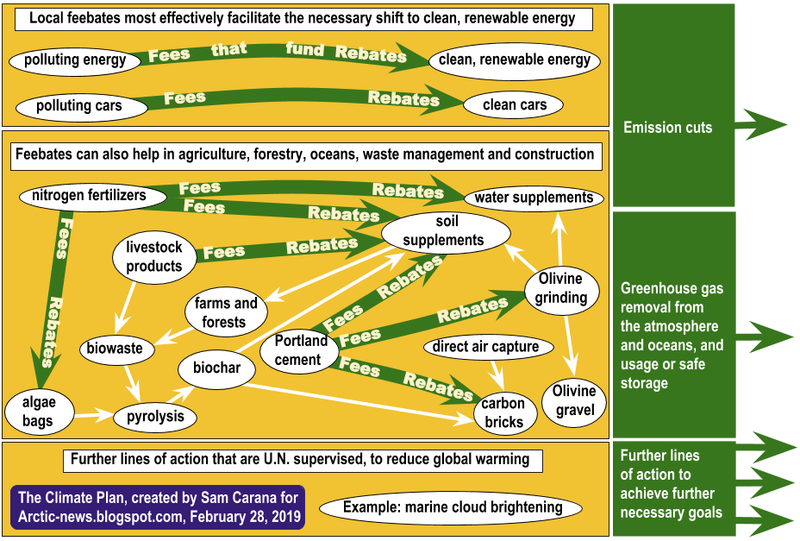 The Climate Plan calls for multiple parallel lines of action (the green lines on the image below). The green lines of action each need to be implemented in parallel, i.e. no line of action should wait for another, nor should action on one line be used as an excuse to delay action on another line. Where lines of action are grouped together in three parts, numbers merely show relationships with the kinds of warming pictured at the top of the image. While implementation of some of these lines of action requires U.N. supervision, the Climate Plan prefers local implementation, with communities deciding what works best locally, provided a community does take sufficient action to achieve the necessary dramatic reductions in each type of pollution. 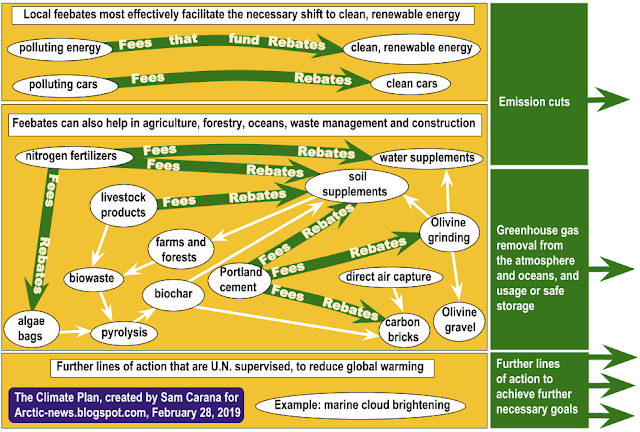 Examples of implementation of some of these lines of action are depicted in the image below, showing examples of how progress can be achieved through local feebates. 1. Where a local community fails to make progress, state (or provincial) fees are imposed in that locality. 2. 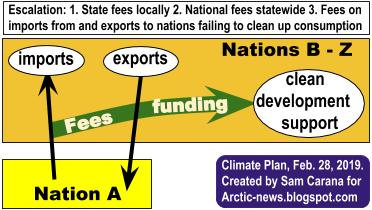 Where a state fails to make progress, national fees are imposed in the state. 3. Where a nation fails to make progress, other nations impose fees on imports from and export to that nation with revenues used to fund clean development in the other nations. The need for action such as marine cloud brightening is illustrated by the following two images. The image below shows that, despite the presence of large amounts of meltwater off the North American coast, sea surface temperatures on March 2, 2019, were as much as 13.8°C or 24.8°F warmer than during 1981-2011, indicating how much more ocean heat is now carried to the Arctic Ocean along the Gulf Stream. How is it possible for anomalies to get this high? 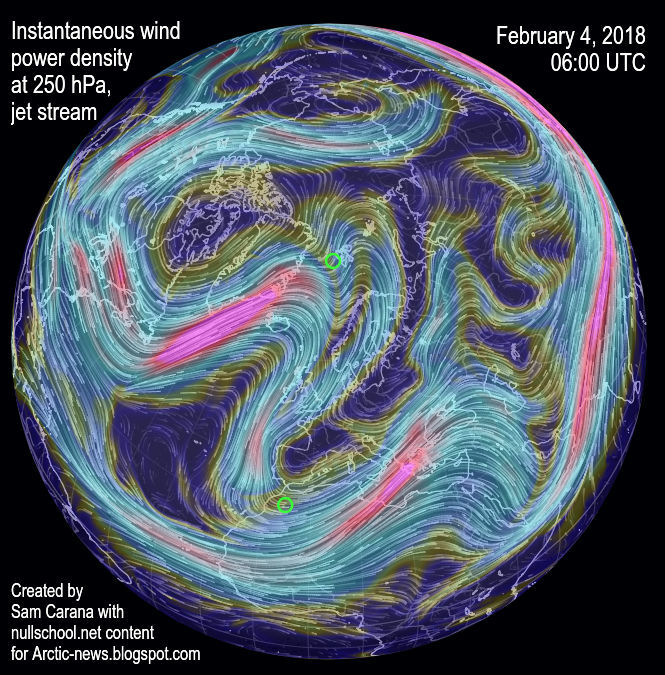 As the Arctic is warming up faster than the rest of the world, the Jet Stream is becoming more wavy. A more wavy Jet Stream enables more cold air to move out of the Arctic. As a result, cold Arctic air can descend deep into the North American continent. At the same time, a more wavy Jet Stream enables more warm air and water to move into the Arctic. 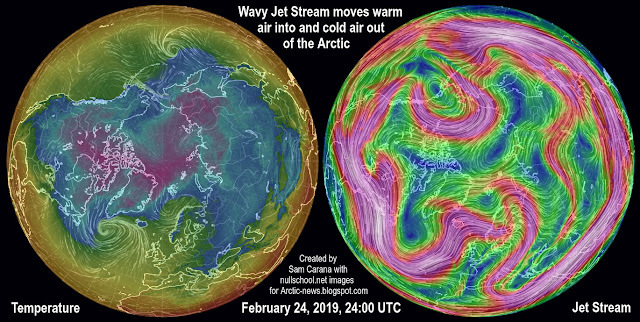 This is illustrated by the February 24, 2019, combination image that shows temperature on the left and the Jet Stream on the right. 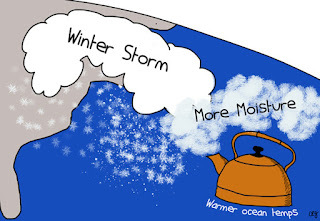 As oceans get warmer, the temperature difference between land and oceans also increases in Winter. This larger temperature difference results in stronger winds that can carry more warm, moist air north in the North Atlantic. These winds can also speed up the amount of heat carried by the Gulf Stream toward the Arctic Ocean, with the threat that a large influx of warm, salty water will destabilize sediments at the seafloor of the Arctic Ocean and trigger eruption of huge amounts of methane. In conclusion, the situation is dire and calls for comprehensive and effective action, as described at the action, policies and feebates pages at the Climate Plan. • Possible climate transitions from breakup of stratocumulus decks under greenhouse warming, by Tapio Schneider et al. • Early Palaeozoic ocean anoxia and global warming driven by the evolution of shallow burrowing, by Sebastiaan van de Velde et al. • Rates of projected climate change dramatically exceed past rates of climatic niche evolution among vertebrate species, by Ignacio Quintero et al. 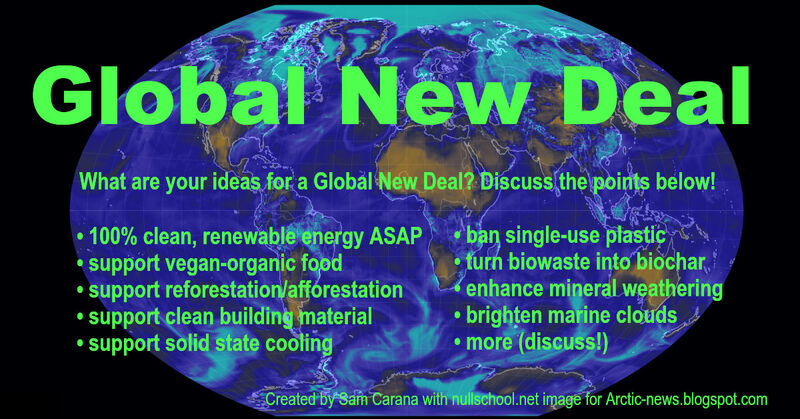 What are your ideas for a Global New Deal? Discuss the points below! For more than a decade, I've been calling for polluting emissions to be cut by 80% by 2020. Yes, I know, it's almost 2020 now and growth in greenhouse gas levels is accelerating. We're running out of time to make the necessary changes. There's a dictator knocking at the door. The dictator is saying that he will stop emissions. He plans to do so by taking entire cities by storm. He is not going to ask you for permission first, he is not out to negotiate and he does not plan to take any prisoners. That dictator is not a person, but he does have a name. That dictator is called Climate Change and he is real. 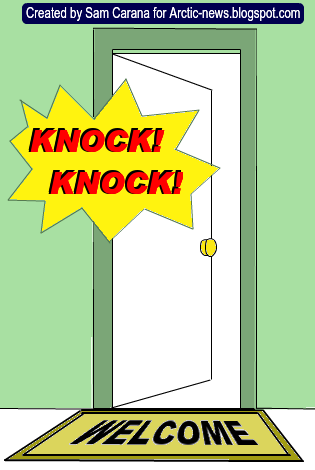 For some time, he has been knocking at your door louder and louder. He plans to come in now. He has already entered your life and he is out to destroy the world as you know it. He plans to keep the lights switched off and stop the pumps working that now make water come out of your taps. He plans to ruin the roads used by delivery trucks that now keep the shelves in the shops stocked. Action is needed urgently. If you keep waiting until the year 2020, before starting to reduce your emissions, the dictator will do it for you. 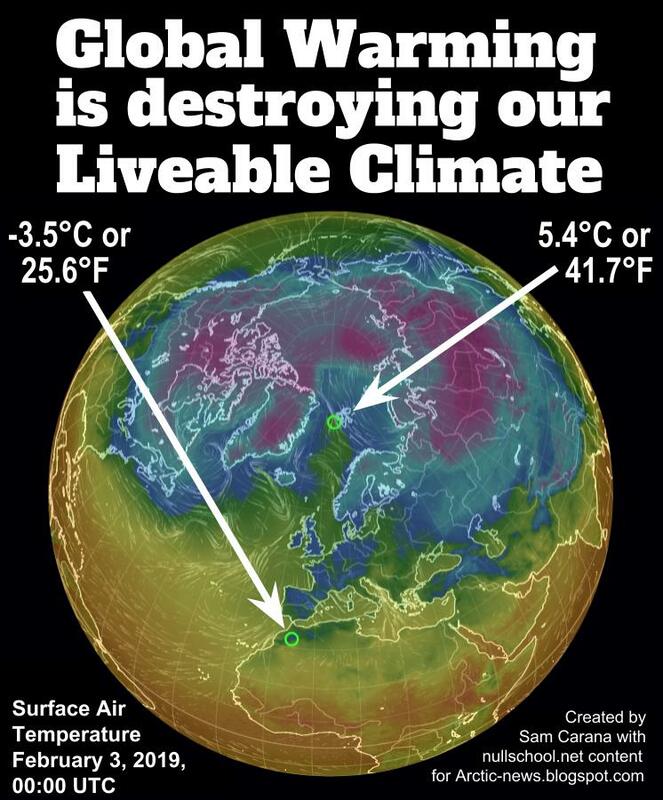 He will stop some emissions, but the pollution will not stop and the temperature will not come down. Why will temperatures not come down? Some emissions contain sulfates that have until now hidden the full wrath of global warming. As these sulfates fall out of the air, there will be severe additional warming. 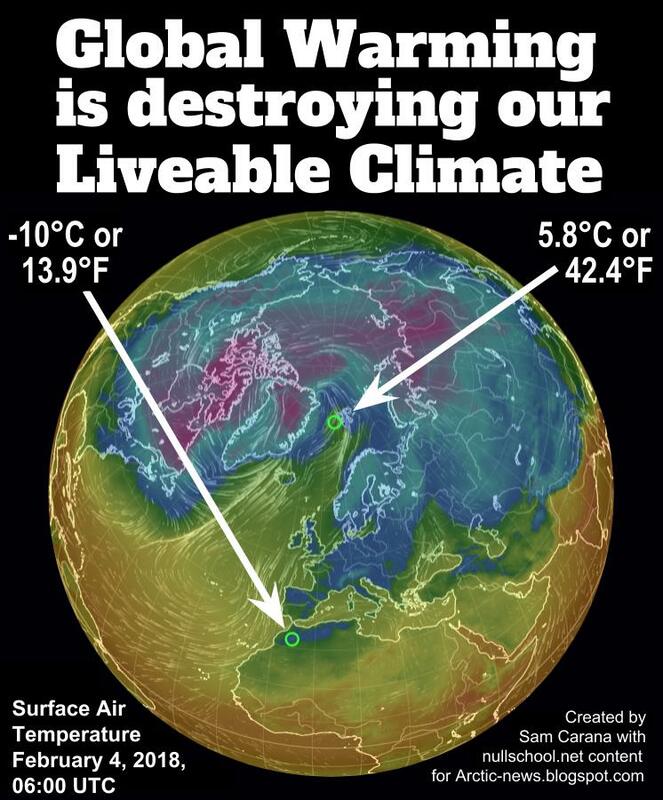 By how much could temperatures rise? How fast? Temperatures could rise by as much as 10°C or 15°F in a matter of years, due to a combination of warming elements as depicted in the image on the right. Pollution will not stop either. As fires, storms and flooding keep destroying entire cities, more pollution will occur and more toxic materials will be left behind. As society comes to a stop, nobody will come to clean things up. Nuclear power plants may melt down without anyone even showing up to make an effort to cool the spent fuel rods. 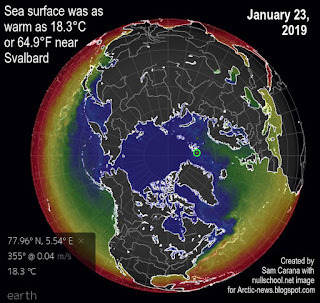 The dictator plans to close everything down and, without action, there will be even more pollution and even higher temperatures, with even more firestorms raging through forests and with heatwaves, cold-snaps and storms getting stronger and more extreme. People will have no food, water or medicine, while diseases go rampant and gangs and warlords loot and devastate the few liveable areas left. We cannot afford to wait any longer with taking action. The dictator is knocking at the door right now and he's got one foot in the door already. The video below, Countdown to Extinction, is a visualization of near-term human extinction by Ken Avidor. The situation is dire and only comprehensive, effective and radical action right now can make a difference. CO₂ levels just reached another record high. 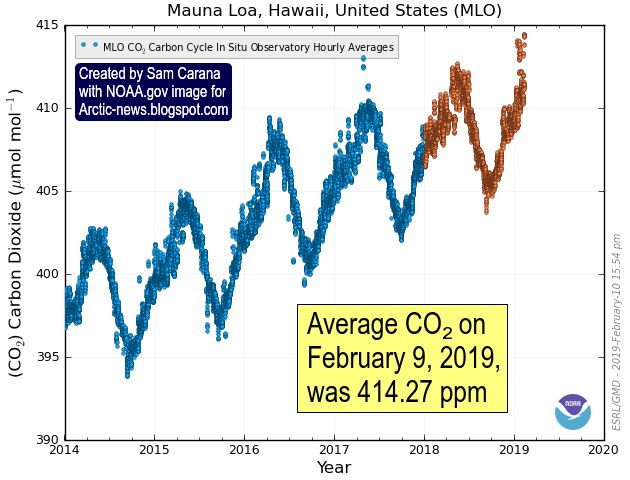 On February 9, 2019, an average daily CO₂ level of 414.27 ppm was recorded at Mauna Loa, Hawaii. The image below shows hourly (red circles) and daily (yellow circles) averaged CO₂ values from Mauna Loa, Hawaii, for the last 31 days. As the image shows, average hourly levels well above 414 ppm were recorded on January 21, 2019, but no daily average was recorded for that day. 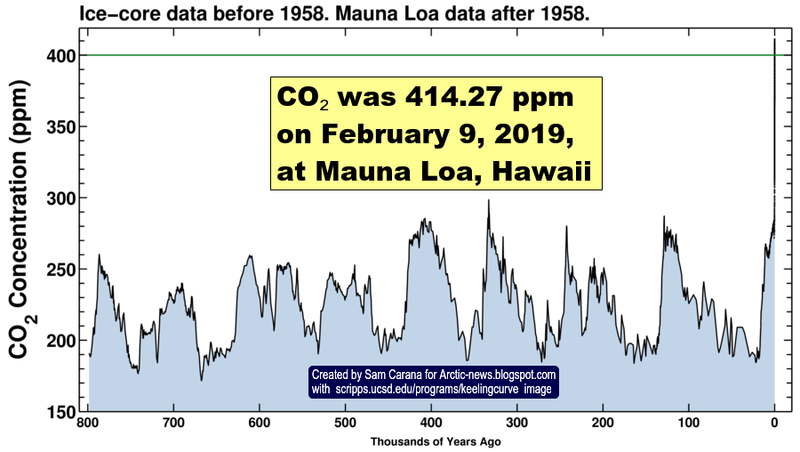 February 9, 2019, was the first time an average daily CO₂ level above 414 ppm was formally recorded and such levels have not been reached earlier over the past 800,000 years, as illustrated by the image below. CO₂ levels can be expected to keep rising further this year to reach a maximum level in April/May 2019. 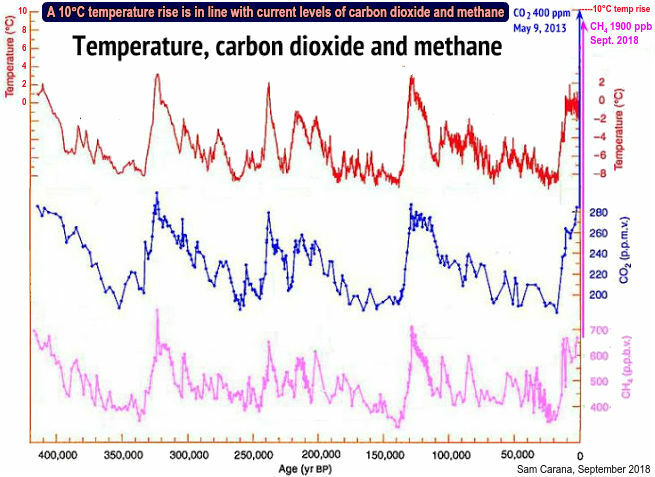 How much can CO₂ levels be expected to grow over the next decade? 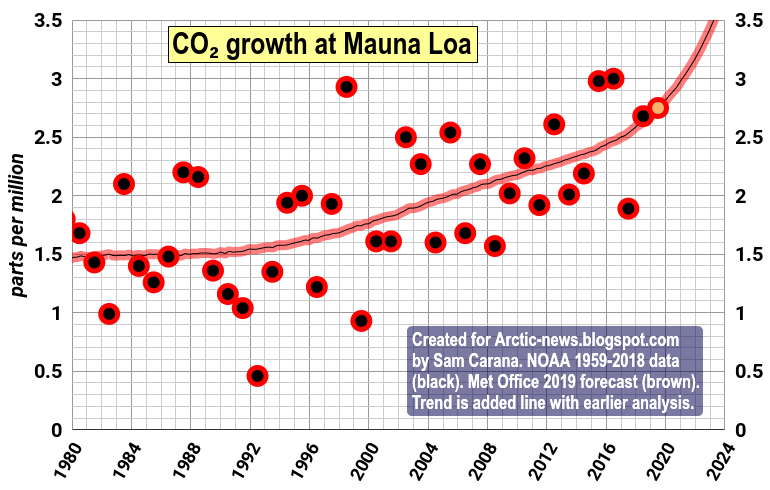 A recent Met Office forecast expects annual average CO₂ levels at Mauna Loa to be 2.75 ppm higher in 2019 than in 2018. The image below shows NOAA 1959-2018 CO₂ growth data (black) and uses this Met Office forecast used for 2019 (brown). The growth figures for 2018 and 2019 are spot on a trend that is added in line with an earlier analysis. Strong CO₂ growth is forecast for 2019, due to a number of factors including rising emissions, the added impact of El Niño and less uptake of carbon dioxide by ecosystems. A recent study warns that global warming will enhance both the amplitude and the frequency of eastern Pacific El Niño events and associated extreme weather events. Another recent study warns that, while the terrestrial biosphere now absorbs some 25% of CO₂ emissions by people, the rate of land carbon uptake is likely to fall with reduced soil moisture levels in a warmer world. Furthermore, fire hazards can be expected to grow due to stronger winds and higher temperatures, each of which constitutes a factor on their own, while they jointly also increase two further factors, i.e. drying out of soils, groundwater and vegetation, and the occurrence of more lightning to ignite fires and to also cause more ground-level ozone that further deteriorates vegetation health. The warming impact of CO₂ can therefore be expected to increase over the next decade, given also that the warming impact of CO₂ reaches a peak ten years after emission. 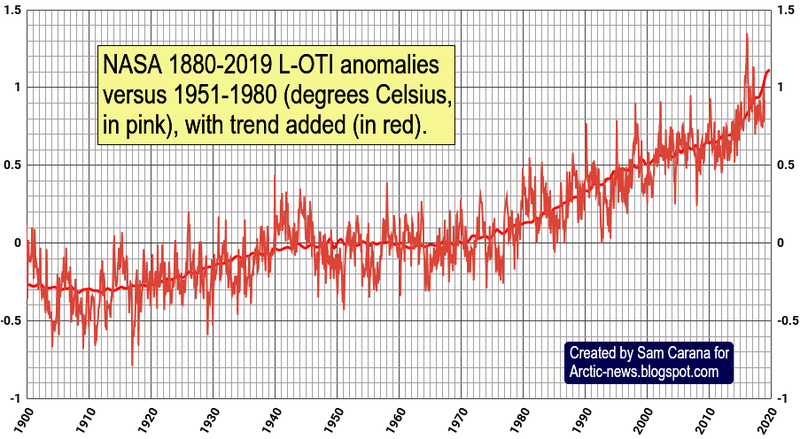 The earlier analysis furthermore warns about strong growth in CO₂ emissions due to fires in forests and peatlands, concluding that CO₂ emissions could cause an additional global temperature rise of 0.5°C over the next ten years. 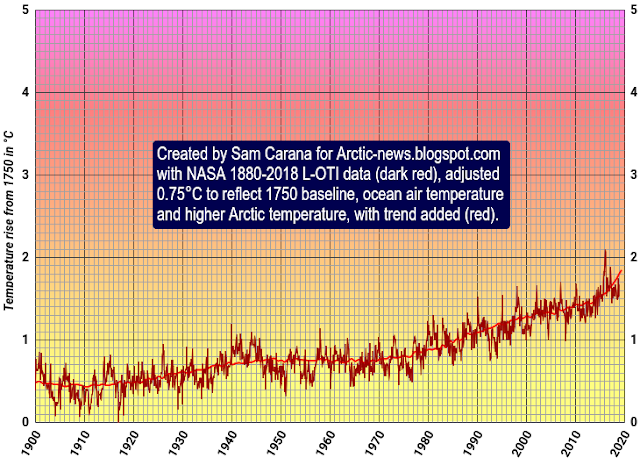 Methane levels are also rising and this rise is accelerating, as illustrated by the image below. 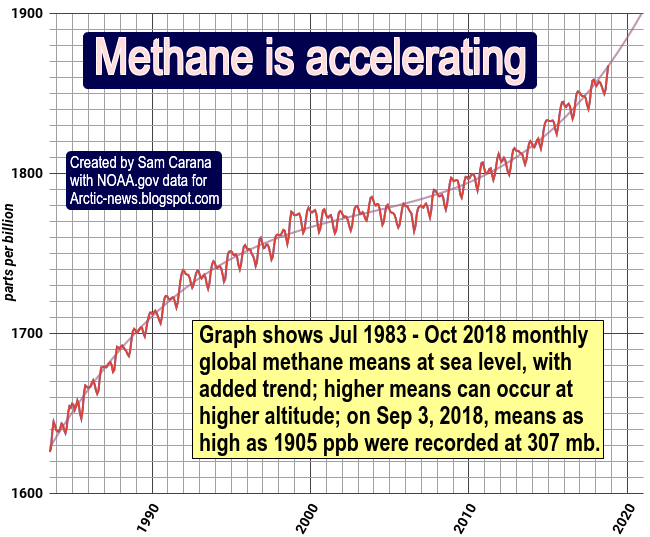 The graph shows July 1983 through October 2018 monthly global methane means at sea level, with added trend. Note that higher methane means can occur at higher altitude than at sea level. 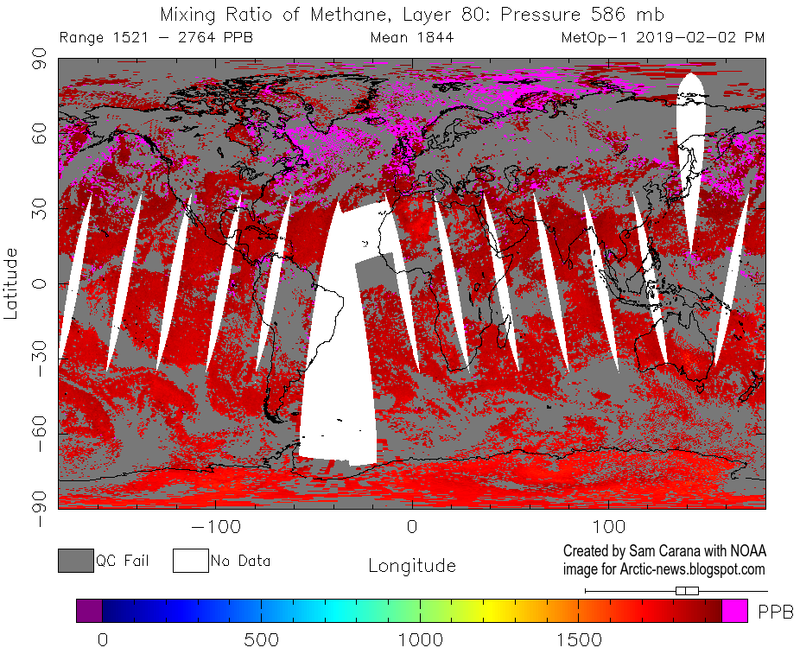 On Sep 3, 2018, methane means as high as 1905 ppb were recorded at 307 mb, an altitude at which some of the strongest growth in methane has occurred, as discussed in earlier posts such as this one. What does the historic record tell us? A 10°C higher temperature is in line with such high greenhouse gas levels, as illustrated by the graph below, based on 420,000 years of ice core data from Vostok, Antarctica, from an earlier post.